Chatoyant quartz is widely available in gray, yellow, and green colours, and it is often misrepresented as chatoyant chrysoberyl. The author examined a pink cat’s-eye quartz that proved interesting because of the unusual cause of the chatoyancy. The 34.65 ct specimen (figure 1) displayed a broad but distinct chatoyant band with a dull vitreous lustre. At first glance, it was reminiscent of chatoyant tourmaline because of its colour. Closer examination with the unaided eye showed colour concentrations in various areas, especially towards the sides. This suggested the presence of a dye along the growth tubes/surface breaks. The specimen appeared anisotropic under crossed-polarizers, with some interference colours perpendicular to the chatoyant band or along the direction of the needles. This suggested a uniaxial mineral, although a clear optic figure could not be resolved due to the dense inclusions. Spot RI and hydrostatic SG were measured at approximately 1.54 and 2.68, respectively. The sample displayed no reaction to UV radiation, and no features were seen with the desk-model spectroscope. These properties indicated quartz, but further analysis was required. With magnification, the sample displayed long tube or needle-like inclusions (figure 2). From the side, some pink colour was observed along these tubes, which again raised suspicion regarding the cause of colour. The cross-section of the tubes was even darker. At higher magnification, some appeared perfectly triangular (figure 3), a feature typically associated with trigonal minerals such as tourmaline. This was further supported by the colour of the tubes and the absorption along the c axis: the inclusions appeared darker when viewed in cross-section. Hence, the bodycolour of the sample was colourless, but appeared pink due to the coloured inclusions. Figure 3: The cross-section of the needles in figure 2 displayed a perfect triangular shape typically associated with minerals belonging to the trigonal system, such as tourmaline. Magnified 64x. IR transmission spectra were obtained both parallel and perpendicular to the needles. In the parallel direction, two sets of distinct peaks were seen: in the 4800–4200 cm-1 region (4594, 4534, 4438, and 4343 cm-1) and in the 3700–3000 cm-1 region (3563, 3585, 3480, 3379, 3300, and 3197 cm-1). According to the database at GTL Jaipur and past studies (see, e.g., L. T. M. Oanh et al., “Classification of natural tourmalines using near-infrared absorption spectroscopy,” VNU Journal of Science: Mathematics – Physics, Vol. 26, 2010, pp. 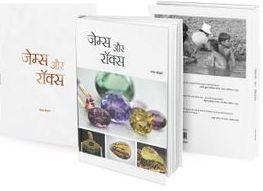 207–212; G. Choudhary and S. Fernandes, “Spectroscopic examination of commercially available quartz varieties: A gemological perspective,” Summer 2011, Gems &Gemology, pp. 146–147), the first set of peaks is similar to those seen in tourmaline, while the second corresponds to those seen in quartz. In the perpendicular direction, only a broad absorption band was observed in the 3700–3000 cm-1 region, due to the lower degree of transmission in that orientation. 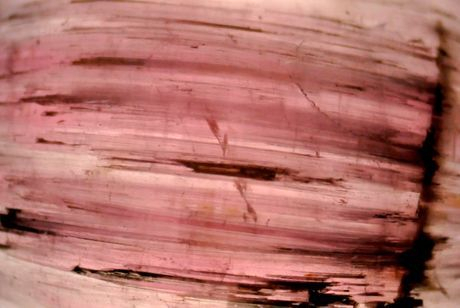 On the basis of microscopic examination and the infrared spectra, this sample was identified as quartz with inclusions of pink tourmaline. Tourmaline is a common mineral inclusion in quartz, but it is mostly randomly oriented. Thus, this sample was interesting and unusual because of its pink colour (though it was not rose quartz) and chatoyancy. Both were caused by the presence of parallel tourmaline needles.